NEW 20 Oct 2014 – A PDF version of the program may be downloaded – click here. This has minor changes from what was previously published. It also includes speaker biographies, talk outlines, Research Help Zone topics and a list of those in our conference group. Printed copies will be supplied on the cruise. A 3 night cruise out of Sydney as a prelude to an optional Norfolk Island tour after. Take a break on board the Celebrity Solstice experiencing 3 exciting nights aboard the Sydney Sampler Cruise. With strong interest in a Norfolk Island tour we have coupled this with an optional 5 day tour to Norfolk Island starting the day after the end of the cruise. 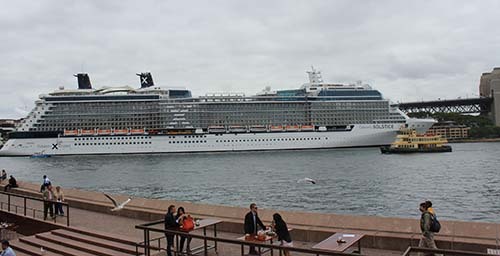 The 4.5 star Celebrity Solstice is rated by many as one of the finest ships operating in Australia by any of the major cruise lines. If you are new to cruising this short 3 night cruise is an ideal way to try out cruising – at a lower cost than most of our other cruises. Do the cruise on its own or bundle it with the 5 day Norfolk Island tour. Or do the Norfolk Island tour only. A genealogy/history conference on Norfolk Island in October 2014 with Shauna Hicks, Australia’s most sought-after genealogy/history presenter and Cathy Dunn, one of the leading 1st Settlement Norfolk Island historians and overall early colonial convict specialist. This conference is planned as a tie in with this 6th Unlock the Past cruise—but may be done on its own independently of the cruise. The conference is now open for bookings. Click here for full details and an booking form.